Here’s some race footage of the Freightliner on course at Pikes Peak. Mike and Gale talk about the effectiveness of the super-turbo system at the end. The course was pretty wet this year which resulted in slower times, but these two guys want to come back for 2014 and be the first semi in the 11-minute range. Mazda debuted their new diesel Mazda6 race cars at the Rolex 24 hour endurance race in Daytona in January. The entire lineup of engines in the new 2013 Mazda6 have benefited from Mazda’s SkyActiv engine technology initiative. It’s interesting to note that while the gasoline engines have increased compression ratios to improve efficiency, the diesel engines worked the other way. Diesel compression ratios are generally in the neighborhood of 20:1, but Mazda found that lowering it about 14:1 meant that all of the engine parts could be significantly lighter which allowed for higher rpm’s and lower bearing friction. This is a vintage documentary from 1952 that details the rise of the modern diesel engine. The story starts during the steam era when people first started using thermal energy to drive compression cylinder engines. From there the evolution goes to an oil burning engine and then to compression ignition pioneered by Rudolph Diesel. The first mass produced diesel engines were well suited for turning generators for electricity production but not much else due to their size and slow speeds. Once direct fuel injection was invented, the relative size of the diesel engine was decreased and it’s rotating speeds increased so that they could be used in ships and eventually tractors, buses, trucks and cars. It’s important to understand that diesel engines are actually less efficient than gasoline engines at the same compression ratio. It’s the fact that diesels can run significantly higher compression ratios that cause their overall efficiency to be much higher. The trade off is that diesel engine blocks and components have to be built much stronger and heavier to withstand the combustion pressures of these compression ratios. That makes their initial cost and durability much higher than their gasoline counterparts. We are going to see an increase in diesel cars here in the US as automakers try to reach higher Corporate Average Fuel Economy (CAFE) figures. Diesel cars are already very popular in Europe, so most manufacturers will be bringing those models to us here instead of funding the expensive development of new hybrid cars. Audi and BMW have already announced extensive diesel lineups for 2013. Jay Leno brings the creator of his Tank Car, Randy Grubb, onto his show to check out his latest creation. Piss’d Off Pete is the fourth car in Randy’s Blastolene line of gigantic automotive sculptures. It’s a scaled up hot rod built around a twin supercharged 2-stroke Detroit Diesel V12 that was originally used for industrial plant work. Each cylinder is 71 cubic inches which translates to a total of 14 liters. We’ve featured it here on the blog before getting frantically rev’ed to it’s 2800 rpm redline. Here Jay and Randy go over the inspiration and finer details of Piss’d Off Pete as well as take it out for a spin. 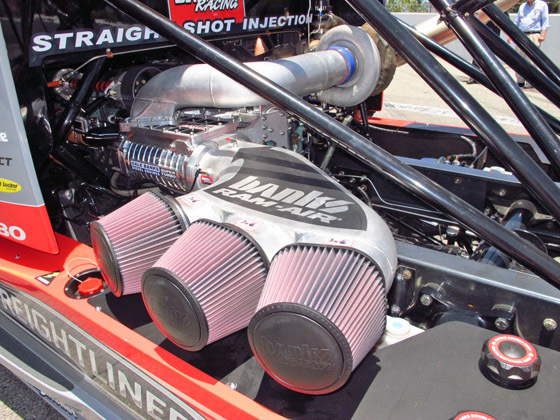 Triple-X Motorsports and Outdoors continues to bring us coverage from this year’s National Hot Rod Diesel Association World Finals that took place in Ennis, TX. Here is a compilation of the fastest runs of the event. They were put down by a pretty unique lineup of vehicles.